Fabulous Long Range Views at 1848 Campbell Drive located in Glen Cannon of beautiful Pisgah Forest, North Carolina. You will fall in love with the 2500 square feet of living area on first floor with a spacious master bedroom suite, a guest room, and bath. The first floor also features a open living/dining room with a beautiful fireplace, picture windows, and eat in kitchen. Entertain your friends and family for a relaxing evening on the screened porch and grill deck. 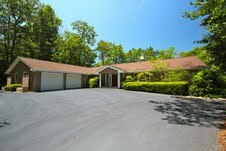 This lovely home also features a utility/work room and garage. The finished basement offers two bedrooms, a recreation/sitting room, bath, storage rooms and ground level entrance on separate heat pump. Plus you will enjoy the isolated shop/exercise room with outside entrance. Glen Cannon is located in Pisgah Forest, North Carolina- and nestled in the foothills of the beautiful Blue Ridge Mountains. You will love the delightfully peaceful, friendly place and enjoy making new friends and bring old ones for a day of fun. Join the Glen Cannon County Club and take advantage of the many amenities such as golfing, swimming, playing tennis, or dining while you are surrounded by a gorgeous view of the mountains. In the evening, having a cool drink on our covered patio or in the dining room, you will be delighted and enchanted by breathtaking sunsets. Located just outside the scenic and popular town of Brevard, our golf course is one of the most enjoyable in Western North Carolina. As you stand on the tee of Hole #2, our signature hole, before you is a cascading waterfall feeding into a crystal clear mountain stream that weaves its way throughout the course. In the spring, flowering trees and azaleas delight the eye. In the summer, the scent of honeysuckle entices the senses. Even on a day when you are not playing your best golf, the beauty of your surroundings will make you smile.